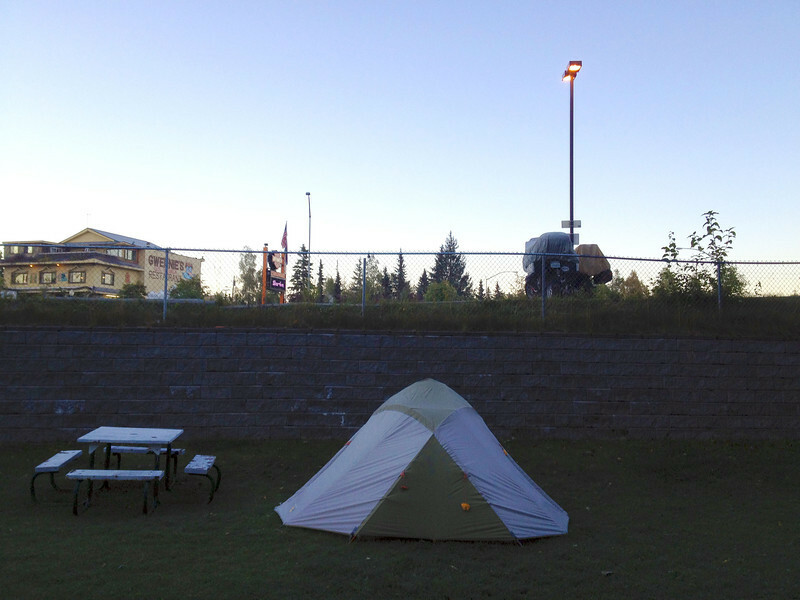 We arrive in Anchorage very late, but fortunately we heard that the local Harley Davidson dealership offers free camping for motorcycle travelers. How nice of them! 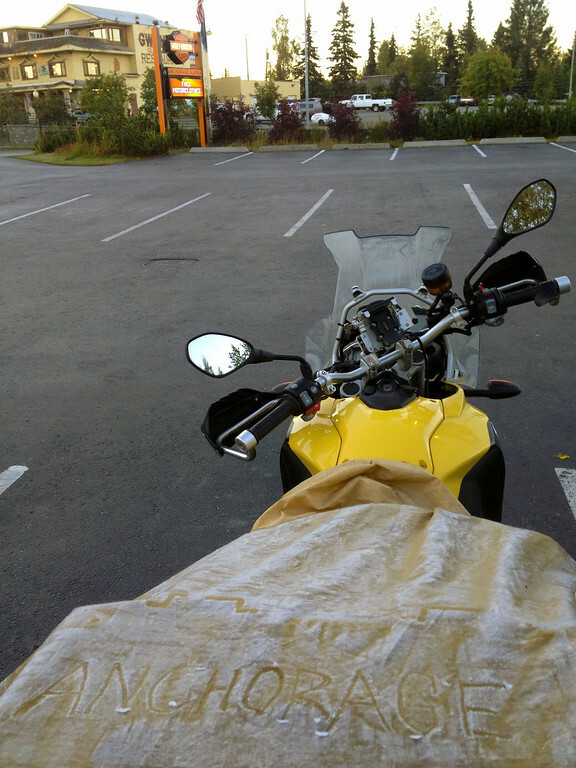 No one is at the dealership on the Sunday night, but fortunately the MotoQuest rental guys (who share the same parking lot as HD Anchorage) gives us access to the washroom and showers. A hot shower feels so amazing after a cold day of riding! If only we could find some way to heat the tent that doesn't require a bean burrito! Another night of sub-zero temperatures. It is friggin' freezing and there are no other campers here. Because they have common sense. HD Anchorage is closed on Mondays, I wish they were open so I could thank them for the free accommodations! 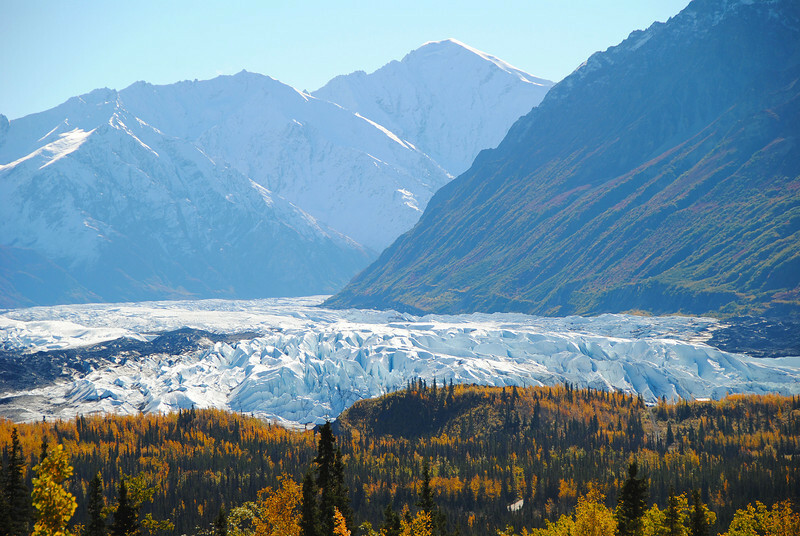 Slightly east of Anchorage on the AK-1N, we pass several magnificent glaciers in Chugach State Park. 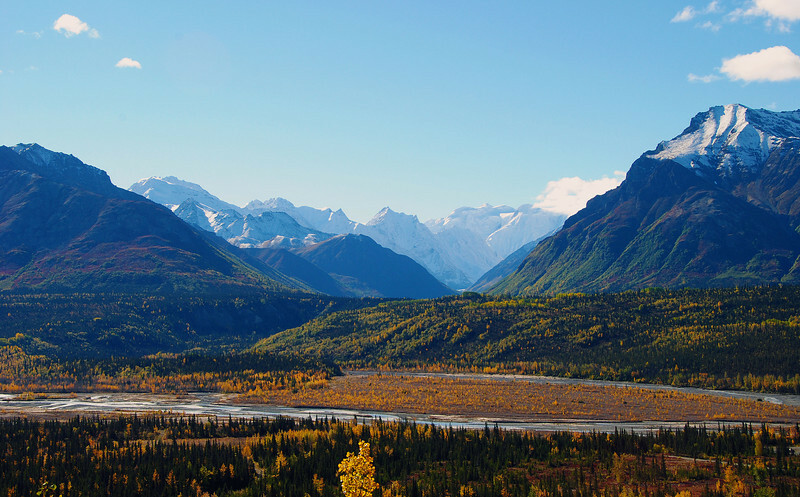 The ride north-east from Anchorage to Tok was a surprise. Nobody told us this road would be so entertaining and scenic. 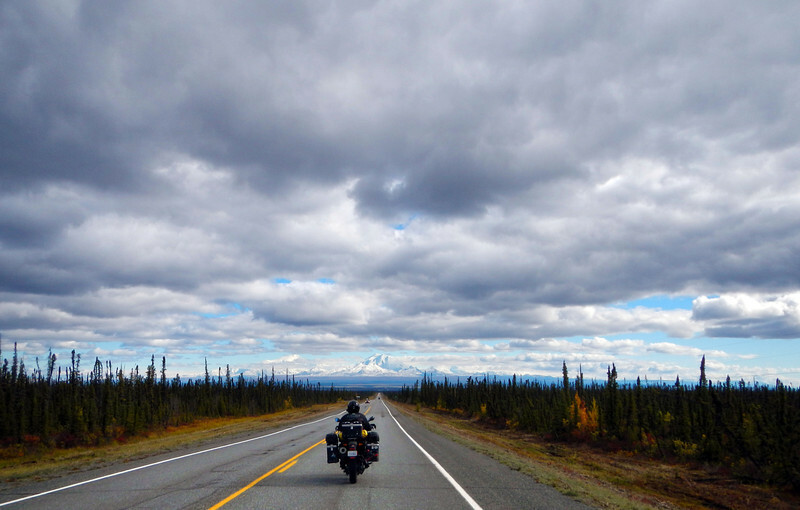 The highway winds through a wide variety of sub-arctic forests, glaciers, streams and mountains. 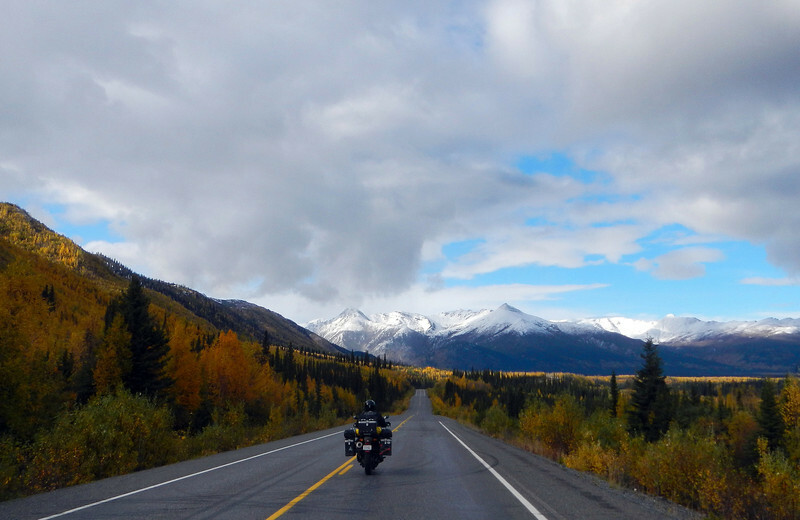 Perhaps its overshadowed by the Dalton Highway, but the road to Tok should be a Must-Do on anyone's list if they are riding Alaska! 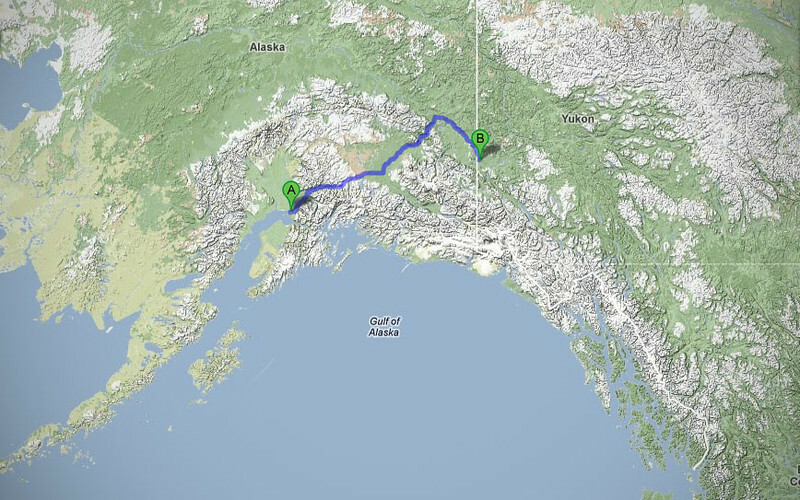 At Wrangell State Park, AK-1 merges with the Richardson Highway (AK-4) and we head north towards Tok. 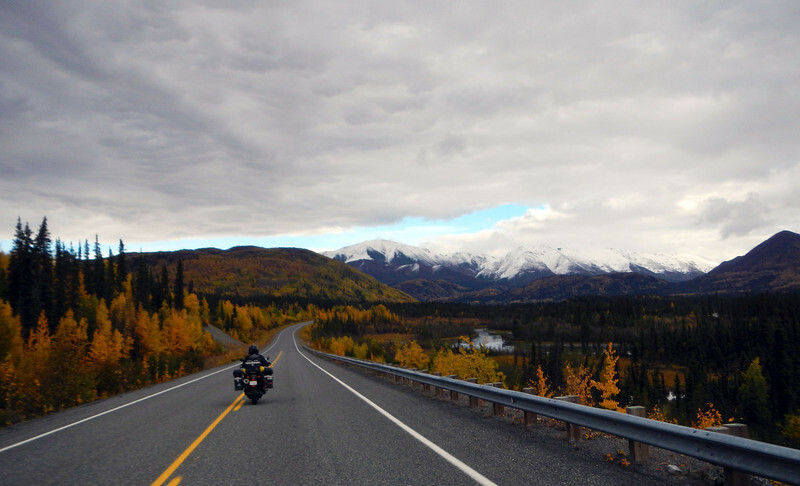 The Wrangell Mountains dominate the scenery for a good hour before we reach the park, and is still visible as we skirt the western edge on our way to the Alaska Highway. The mountains are all volcanic, and make up two of the top three highest volcanoes in the US. 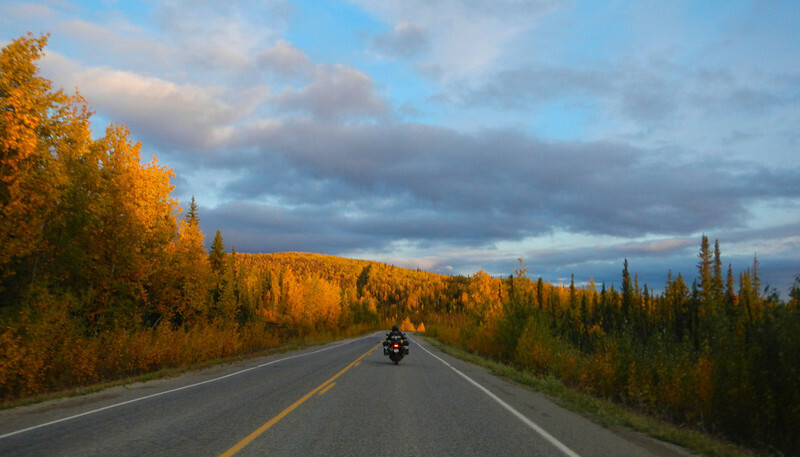 We arrived at Tok in the late afternoon, at the intersection of the Richardson and Alaska Highway. So we settled in at the Tok Visitor Centre for a homemade sandwich. In the parking lot, we see Bob from Switzerland's bike. Except it wasn't Bob from Switzerland. 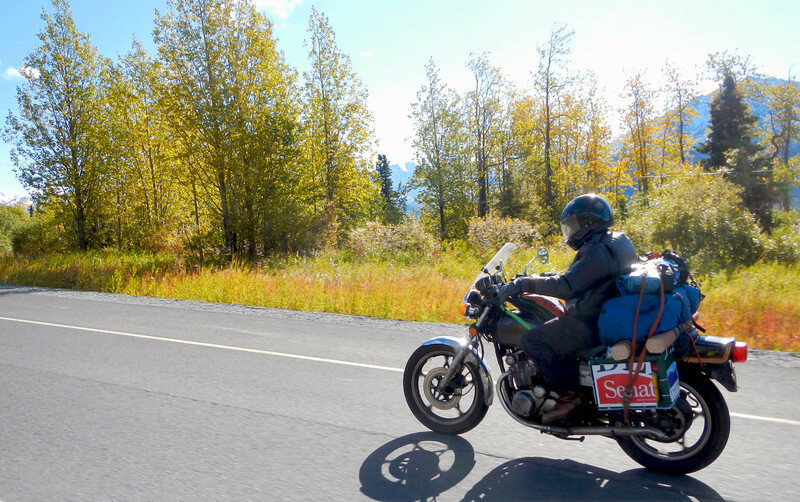 All the panniers were fashioned out of pieces of electoral signs. One read Bob, and another was a fragment reading "CH" on the back! 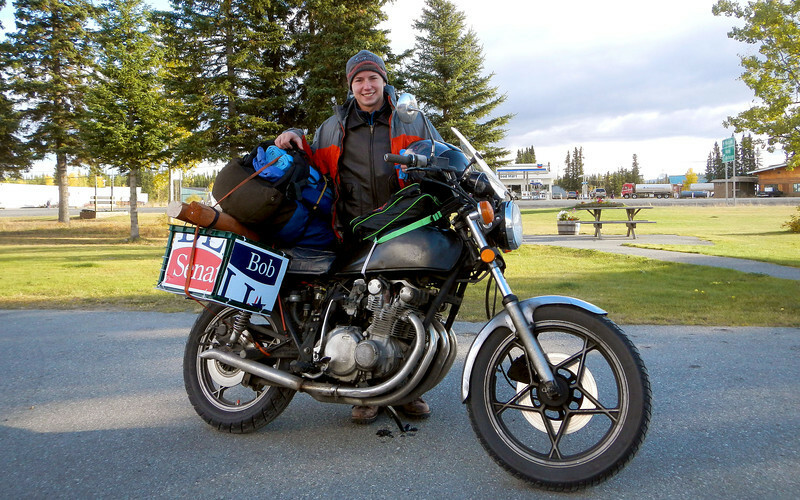 Inside, we met Austen, a 22-year old adventurer from Anchorage on Day 1 of his own Round-The-World motorcycle trip. I remember when we first set out way back in the middle of June, and how we told everyone we were on the Never-Ending-Motorcycle-Trip. Funny, that doesn't seem that long ago at all! Bob from Switzerland? No, Austen from Anchorage! Austen left Tok before us, since his pace was a bit slower. We told him we might see him again on the road when we crossed the border. 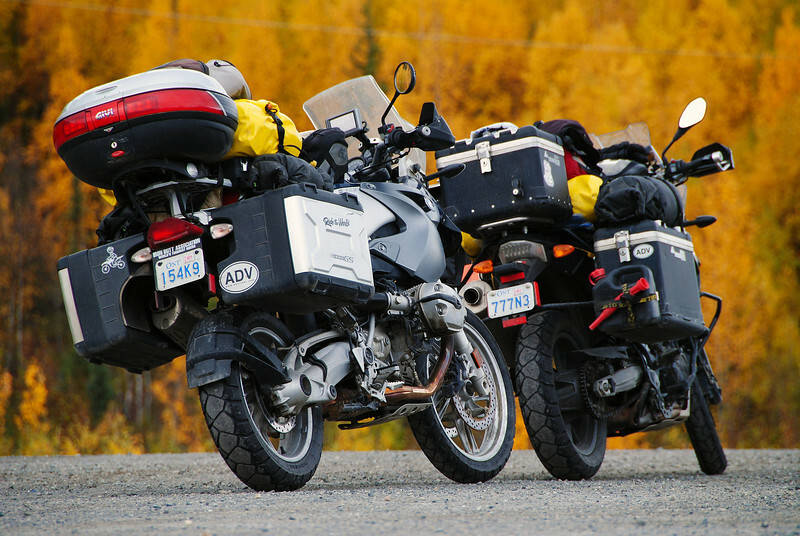 The sun was setting very fast, and since we spent more time in Tok than we wanted to, we arrived at the Alaska/Yukon border in the freezing darkness, all our electrics cranked to the highest setting. Immediately upon crossing the border, the pavement became more broken, and we crossed several gravel patches in the dark at highway speeds, causing some pucker-moments. I guess that's what happens when you ride from one of the richest states in the US to one of the poorest provinces/territories in Canada. The actual Canadian border patrol was about 20 kms past the geographic border. Not too worried about national security up here... The guard at the customs building looked at us with pity and told us there were hot showers at a campsite in Beaver Creek, about 10 kms away. As we arrive at the campsite, a couple of Eastern Europeans hop out of a rental car at the gas station and ask what kind of tires we were running. Strange question. They told us that it was snowing heavily just an hour east at Destruction Bay, and that they were slipping around on their four-wheels, they seemed genuinely concerned about our safety. We assured them we were staying put for the night. The tent went up slowly, with all our cold-weather gear on, gloves and everything. We knew it was below 0C because there were icy patches everywhere. We could see our breath inside the tent! And it got even colder overnight, as we shivered in our sleeping bag with all our winter clothes on underneath. During the middle of the night, I checked the weather app on my iPhone: -9C (15F).